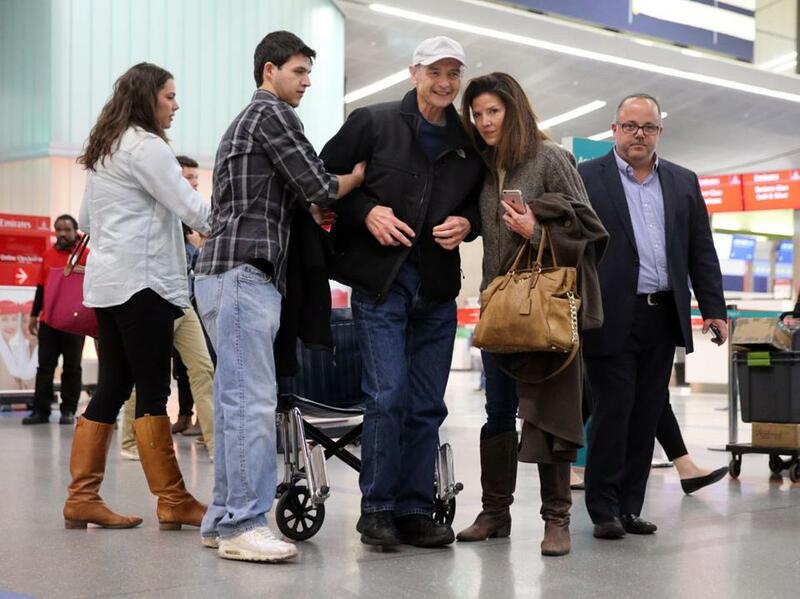 Sal DiMasi arrived at Logan Airport Tuesday. Former Massachusetts House speaker Salvatore F. DiMasi returned home to Boston Tuesday after being granted early release from federal prison on an eight-year sentence for public corruption charges. 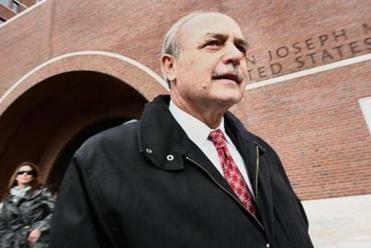 DiMasi, 71, arrived at Logan Airport around 5 p.m. with his family. Wearing blue jeans, a black jacket, and a beige-colored ballcap, DiMasi smiled as his wife, Debbie, and other family members pushed his wheelchair toward a throng of waiting reporters. “I just want to say how happy I am and grateful and thankful that I’m home in Boston,” said DiMasi, who was accompanied by his wife and step children, Ashley and Christian. DiMasi, once one of the state’s most powerful figures, thanked everyone who had worked for his release and said the time leading up to it has been difficult. What restrictions will DiMasi face under house arrest? The former Mass. speaker is scheduled to be released from a federal prison in N.C. later today. DiMasi said he would draw near to relatives during the holiday season.“This is going to be a very special Thanksgiving for me at home with my family,” he said. DiMasi said he looked forward to “being reunited” with his family, adding, “I just want to tell you how much I love my wife,” who had campaigned tirelessly for his release. Smiling, DiMasi said his wife “has been my champion” during his incarceration. DiMasi was sentenced in November 2011 to an eight-year prison term after he was convicted of helping a Burlington software company win $17.5 million in state contracts in exchange for kickbacks. He served five years of an 8-year sentence. He thanked his wife and other supporters for encouraging him in his battle against cancer. “I’m a fighter,” said DiMasi, once known as a shrewd and tough negotiator on Beacon Hill. The former speaker took no questions but wished reporters a Happy Thanksgiving and said that for him, Thursday would be a “special” holiday. Family members led DiMasi to a waiting car outside the airport after he made his brief statement, as curious travelers and airport security staff looked on. DiMasi was released earlier in the day from a federal prison in North Carolina. The former North End Democrat will now return to his wife’s home in Melrose where he will be spend the next six months in home confinement. Under an order from US District Court Judge Mark L. Wolf, DiMasi must serve two years of supervised release, the first six months of it confined to his home. DiMasi’s movements will be severely restricted: he may leave home only for emergencies and for medical appointments and religious reasons. While in prison, DiMasi was diagnosed with throat cancer and later prostate cancer. The cancers are in remission, authorities say, but the treatment for tongue cancer severely affected his throat and his ability to swallow. He has had choking episodes and has undergone numerous medical procedures to help him swallow and to prevent food from entering his lungs. “This is going to be a very special Thanksgiving for me at home with my family,” he said. Travis Andersen can be reached at travis.andersen@globe.com. Follow him on Twitter @TAGlobe. Milton J. Valencia can be reached atmilton.valencia@globe.com. Follow him on Twitter @MiltonValencia.